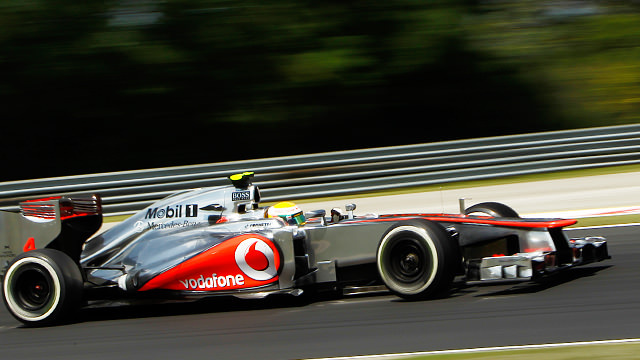 Welcome to F1Minute - Lewis Hamilton puts McLaren on top for practice in Hungary. Lewis Hamilton and Jenson Button were the fastest duo at the Hungaroring in first practice, with the pair dropping the times into the 1:22s. Third place Fernando Alonso was almost half a second further back. Meanwhile, Pastor Maldonado had a bit of a wobble running off track, whilst Valtteri Bottas in the other Williams was having a much better time of it than he did last weekend. Once again, Mark Webber and Sebastian Vettel were conservative on their pace, both Red Bulls finishing outside the top ten. The second ninety minute session was hit by changeable conditions when all of a sudden the clouds gave up and let the rain fall. Lewis Hamilton set the fastest time before the rain came down. Despite bolting on the wet tyres, Michael Schumacher still found his way into the barriers - aquaplaning the Mercedes car off track and out of the session. With Hamilton on top, Kimi Räikkönen found his way to second fastest with Bruno Senna showing well for Williams in third.